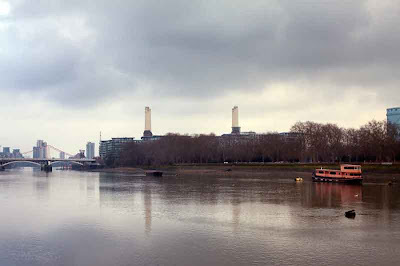 A view towards the Battersea Power Station. Take a look at skies presented by other skywatchers today. Nice perspective on a very gray day. I love this stretch of the river! Love the colors. Looks like a storm is a comin'. Thanks for your visit, Mo! You can make even a power station look as charming as your bridge photos! I love that boat's color and the reflections on the river. Have a lovely weekend! I have special feelings for Battersea Power Station thanks to the cover of Pink Floyd's Animals album 1976. Great shot of the gray sky. Love the reflection too.